Sixty years ago, a seamstress from Montgomery, Ala. took a stand by sitting down. Rosa Parks’ simple act of defiance sparked the Montgomery Bus Boycott, and ultimately ignited the modern civil rights movement. On December 1, 1955, after a long day of work at a department store, Parks boarded the Cleveland Avenue bus for the commute home. With several white passengers left standing in the aisle, the operator stopped the bus and asked four black passengers to give up their seats. Three complied, but Parks refused and remained in her seat. 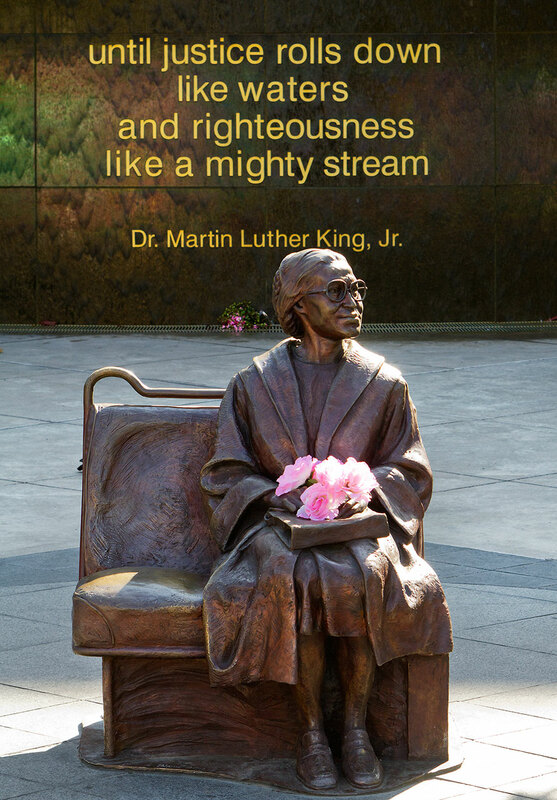 Her quiet strength is permanently remembered in Dallas at DART’s Rosa Parks Plaza, which opened in July 2009. The plaza is highlighted with a life-size bronze statue of Parks sitting on a bus bench. San Francisco artist Erik Blome said he designed the statue to “invoke a feeling of determination and a presence that has solidity to it and a beauty that transcends time.” Visitors to the plaza can actually sit next to Parks’ likeness to reflect on the courage she displayed decades ago. Rosa Parks Plaza serves as a transfer point for more than a dozen bus routes and is distinct from any other transit facility in DART’s service area because of its park-like setting. The plaza was designed as an urban oasis that includes a water wall, landscaping, green space and ample shelter from the elements. Small acts of courage can change everything. DART honors the courage of Rosa Parks. 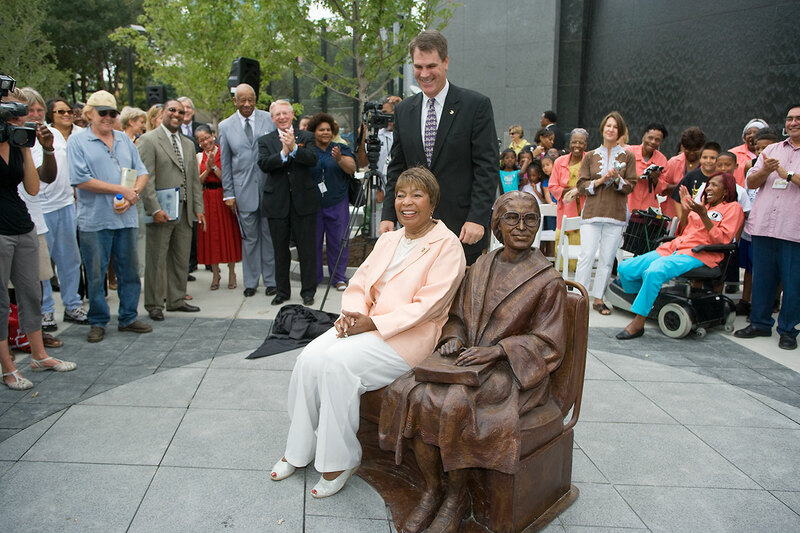 Rep. Eddie Bernice Johnson sits with the Rosa Parks statue at the Rosa Parks Plaza unveiling in July 2009.